Fulge, Jesu, fulge. Terram hanc Patris gloria imple. Arde, Spiritus, arde. Corda nostra accende. Flue, Flumen, flue gratia et misericordia gentes inunda. numinosum tuumet in lucem tuam. Per sanguinem licet mihi ut splendorem tuum intrem. Me perscrutare, me tempta, tenebras meas totas consume. vitae nostrae acta tua, hic reddita, narrent. It’s hard to decide what was most important about my nine-month experience living in Jerusalem. Was it the ways in which the Holy Land was strange or unexpected, different from other places? Or was it the ways in which it was so ordinary, so much like what I already know? Unfamiliar but eye-opening to me was the physicality of the land: the ups and downs of Jerusalem, where many of the streets are like staircases; the steepness of the Mount of Olives, which my leg muscles still remember; the deep clefts of the Kidron and Hinnom valleys; and the sight of Mount Tabor arising alone from the plain of Jezreel (“one will come who is like Tabor among the mountains” – Jer 46:18). 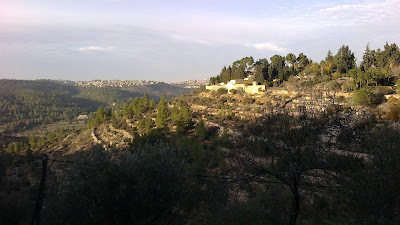 Then there was the shortage of rivers and streams, so strange to an Englishman, and the closeness of the desert – you only need to go to the Mount of Olives and look eastwards beyond Bethany to see the first barren hills of the Judean wilderness. Oddly, because of the return of the rains after six or seven months of hot drought, the autumn was a time of new life for the grass and the flowers, a phenomenon that also brings to life the words of the psalm about the autumn rain covering the bitter valley with blessings. Fiercely strong midday sunshine meant that even in winter children could be seen playing in the fountains. The gnarly olive trees are a constant and iconic feature, and I got a quiet pleasure in using oil pressed from the olives of the friary garden. I never enjoyed salad so much as I did in the Holy Land, where most of it, along with the fruit and veg, is fresh and tasty. Last and smallest, but by no means least among the natural features, were the mustard seeds: so much smaller than the mustard seeds we’re familiar with, and growing well above head-height into shrubs with trumpet-shaped yellow flowers, which attract the shiny blue-black Palestinian sunbird to feed on the nectar. I never got the hang of bartering – I probably got ripped off a few times – but it’s a method that requires you to enter into a relationship with the shopkeeper, rather than mechanically paying a predetermined price. In the local culture the key factor is not what you know but who you know. I eventually learnt which people would give a good price to a poor Franciscan. Family relationships are also very strong and important. Meanwhile, the obvious religious atmosphere was an unfamiliar but welcome experience; talking about God is quite normal, and the Muslim calls to prayer and the Jewish trumpets heralding the Sabbath still echo in my mind. Going to Masses in Arabic, where God is invoked as ‘Allah’, was an eye-opening experience. One of my favourite memories is of hearing ‘Laudato Si’ being sung in Arabic in the Palm Sunday procession. Less welcome memories are of the prevalence of checkpoints and guns: it was quite normal to round a corner in Jerusalem to see a dozen fully-armed police or soldiers marching towards you. The hostile political atmosphere was unsettling; but I did realise that it has a lot of similarities with the situation in the time of the Gospel: then it would have been Roman soldiers patrolling the streets. All of these strange experiences serve to make the Bible less strange. But there were other experiences that were almost as strange in their familiarity. My previous mental image of the Holy Land didn’t really include green fields; but in fact for nearly half the year it is a ‘green and pleasant land’. 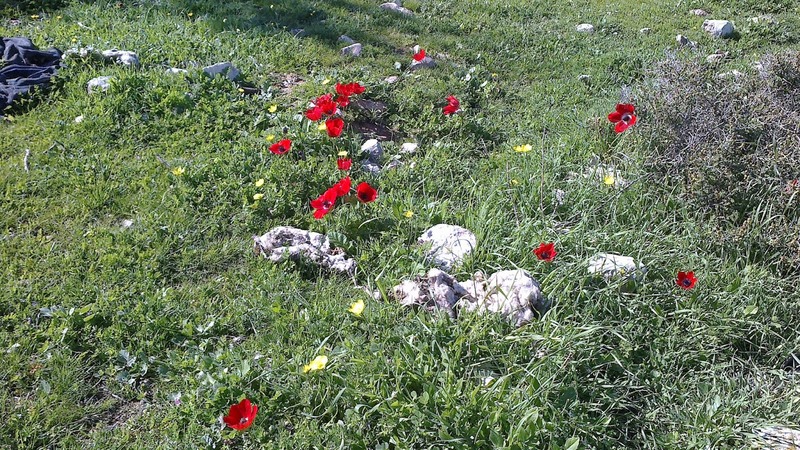 During the wet season the limestone hills of Judea are not dissimilar to the Pennines, and Galilee in the winter is like the Lake District in the summer. Dry-stone walls and flocks of sheep also served to remind me of our National Parks. I knew that the Promised Land was supposed to be a fertile country flowing with milk and honey, and John’s Gospel tells us that people sat down on green grass when Jesus fed them with five loaves and two fish; but I wasn’t prepared for how much the hills around Galilee could look so much like England or Wales. I also wasn’t prepared for cold nights, needing several layers to keep warm while sleeping. The people were in many ways like people anywhere. Children could be seen playing on their bikes or in the fountains, families would picnic in the parks, and of course smartphones were everywhere. Staying a night in a Palestinian village, I played noughts-and-crosses with the children. People enjoy the sunshine and stay out of the rain if they can, and they laugh and grieve like other people do. Some people were aloof, some were friendly, and some would go out of their way to welcome a stranger and help him on his way. 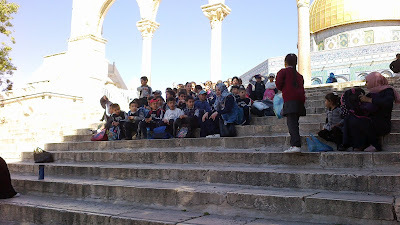 I especially remember an Arab, who couldn’t speak any English, giving me and another friar a lift to the bottom of Mount Tabor when he saw us waiting at the bus-stop, and even offering to buy us something to drink. Traffic rules are much the same as at home, apart from driving on the right. All the nations are flowing to Jerusalem, making it strikingly diverse at times; but even that felt quite familiar to someone who had been living in multicultural London the previous six years. West Jerusalem and other Jewish areas looked and felt very much like European or American cities, while the Old City and the Arab areas were more noticeably Middle Eastern in their culture. But even the latter could feel very homely. I loved to visit Bethlehem: there was something wonderfully comforting about the atmosphere there. And Nazareth, once a village of only 200 and now a small city, still feels cosy in its hollow in the hills. The ancient houses, being half-cave and half-building, are somewhat reminiscent of hobbit holes. The grotto of the Annunciation was part of one such home, and still seems homely, despite the big basilica on top of it. All these feelings of familiarity make it seem more likely, more believable that miracles can happen in my own country, if the great events of salvation can happen under the same blue sky. 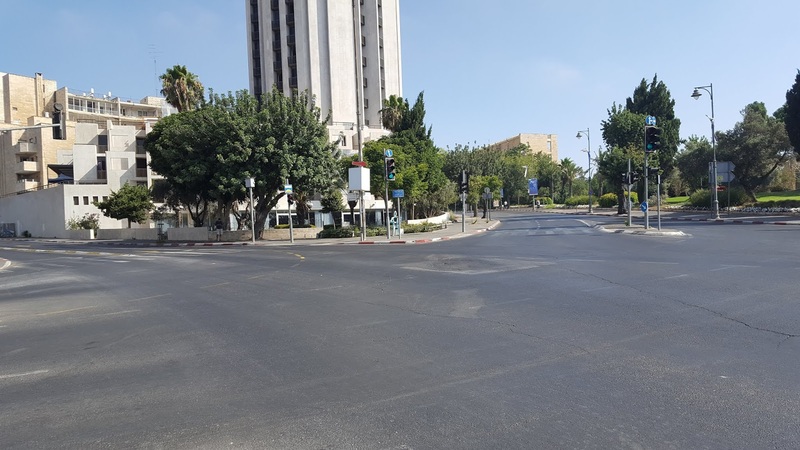 On Friday afternoons here in West Jerusalem, the roads slowly get quieter, while behind people's front doors there's a last flurry of activity. Food is prepared for the next 24 hours, and timers are set to switch lights on and off at the necessary times. When the time of sunset arrives a siren sounds, and households light candles and welcome the Sabbath - or 'Shabbat' as it is pronounced in Hebrew. In the dusk the streets suddenly become busy again - not with cars, but with people walking to synagogue. There's a great silence on Saturday morning, with only the occasional car driven by an Arab or some other Gentile. I've been told that you can safely sit in the middle of the road - but I haven't tried it! Jews walk to further synagogue services, but it's a more spread-out activity than the previous evening. Brits who are my age or older can remember when Sunday mornings were like this: a general quiet, with the only traffic being people heading to or from church (even in my childhood less than half the population would be bothering with that). As afternoon comes on, things get busier, as families go out for walks or to frequent the parks. The shops remain closed, but some cafes and restaurants are open (staffed by Gentiles, of course!). Again, this is rather what Sundays used to be like in Britain. Shabbat-observance isn't just about not shopping or working, however. It also involves switching off from TV, internet, and (gasp!) even your phones for the day. All of this adds up to make the Sabbath a day different from every other day. Which is a refreshing thing in itself, but is also a reminder of the One Who is totally different and helps to make space for Him for speak. Because of Jesus' criticism of overly-strict Sabbath-observance, we Christians tend to be more relaxed about how we observe the Lord's Day. But Jesus didn't reject the Sabbath itself, and His criticism was not unlike that of other rabbis. From our Jewish brethren we can re-learn something of making a day holy to the Lord. For one thing, I'm training myself to switch off from the internet on Sundays. I'm sorry to say, dear pilgrim, that I cannot take you all the way on this last leg of the rosary pilgrimage. But let us go as far as we can. We finished the sorrowful pilgrimage up in the Calvary Chapel, and from there it's only a short distance to the Tomb (or Sepulchre) of Jesus (cf. John 19:41-42), within the same large church. 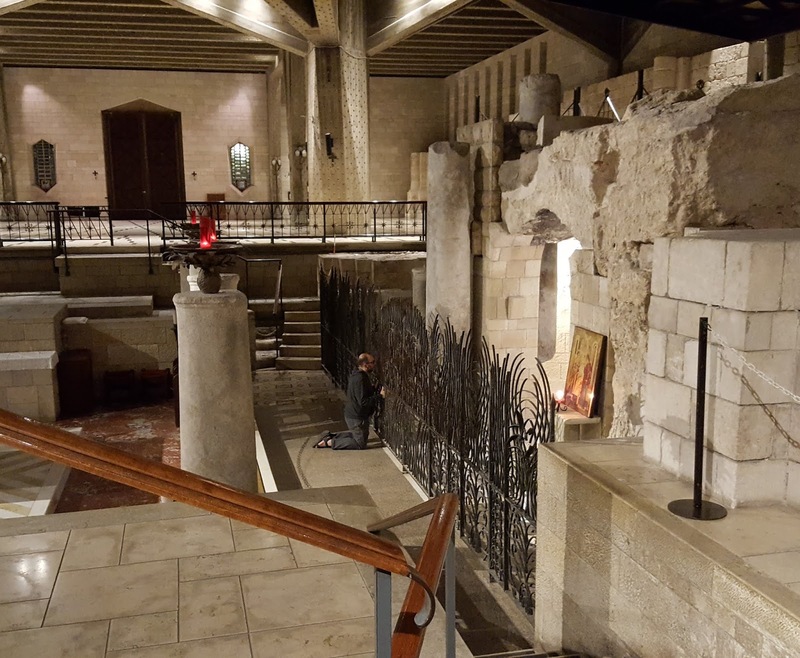 Go down the steps to the ground level and head on past the marble slab on the floor, which marks where Jesus' body was prepared for burial (John 19:40). Alternatively, if you've just entered the church, turn left at the aforementioned marble slab (I'm giving detailed directions here because so many pilgrims get a bit lost, there being no signs in the church). 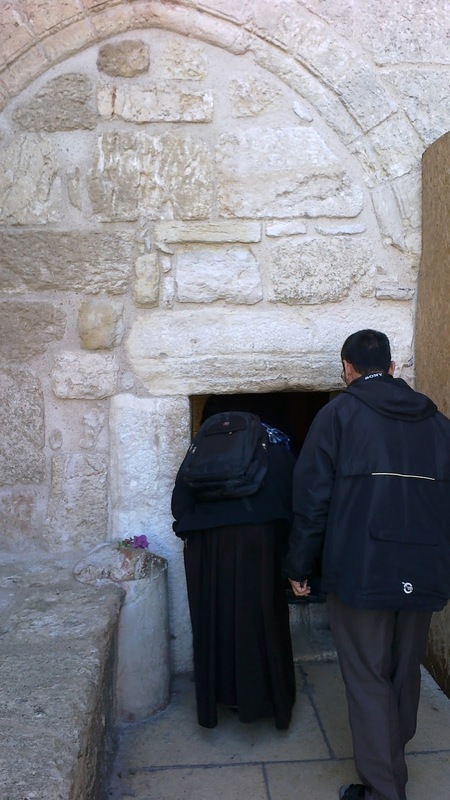 Bearing slightly to the right, you'll come to the 'Edicule', which houses the Empty Tomb. 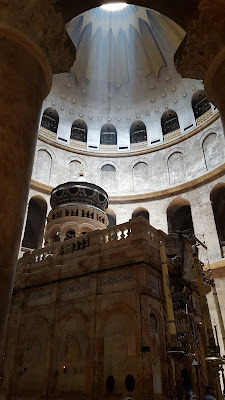 When the Christians were first able to build a church on this most important site, they didn't do what we would probably do today, which is to preserve the tomb in its original appearance. This was partly because the place had been damaged by the Temple of Jupiter the pagan Romans had plonked on top of it, but also because the ancients had different ideas from us about how to do honour to holy sites. So they quarried away the small hillside, leaving only the rock immediately surrounding the Tomb. This was then encased in an ornate construction, which like the church as a whole had to be rebuilt twice in its history. The result confuses some pilgrims - I've been asked several times, "Excuse me, what's in there?" The proper answer to that question, of course, is "Nothing." 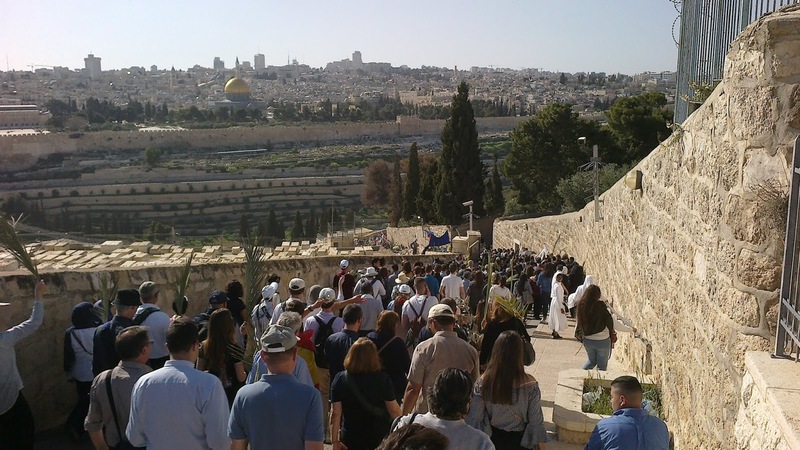 Pilgrims come from all over the world to visit the Tomb not because Jesus is there, but because He isn't. 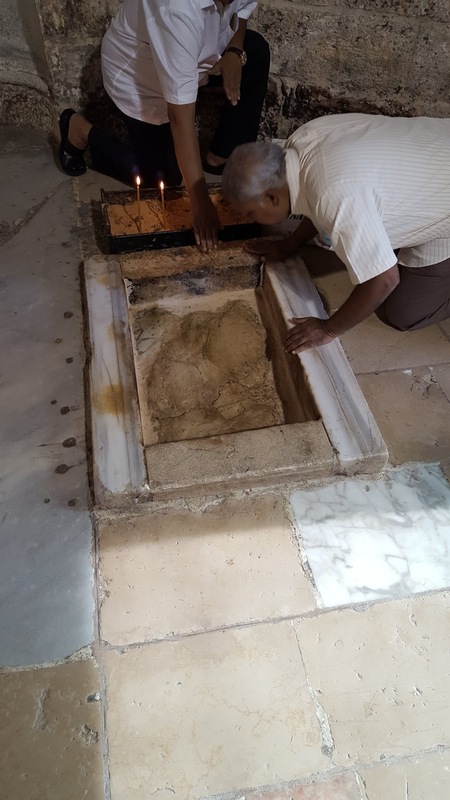 If He was there, the Tomb would be no different from the tombs of prophets and holy men that Jews and Muslims visit, rather than the place where everything changed for ever. The queue to visit the Tomb always seems to be longer than that to visit the Rock of Calvary - I guess people prefer the Resurrection to the Cross. A good rule-of-thumb is that if the queue extends about halfway around the Edicule, it might take about an hour to get in. If you have the time and the patience for whatever wait is involved, you come first into an entrance lobby. In the centre of this lobby is a plinth containing a section of the rock that was rolled away from the door of the Tomb. Beyond, through a low opening (mind your head!) is the Tomb proper. A marble slab covers the limestone slab on which Jesus was laid and from which He rose to new life. You're only allowed a few moments there; but take at least one moment to give thanks for your baptism, by which you were buried with Christ and rose with Him to walk in newness of life. The view to the east from the Mount of Olives rapidly becomes desert as the land falls towards the Jordan and the further lands of Moab and Ammon, so it was an important vantage point in time of war. To the west, however, is an iconic view of Jerusalem. The golden Dome of the Rock in the middle distance occupies the spot where the Temple stood in Gospel times - an uplifting sight for many a Jewish pilgrim, but a matter of grief for Jesus (Luke 19:41-44). That Temple of stone remained on earth while the Temple of Christ's body went into heaven. You can usually take as much time as you want to pray here, so long as you leave space for the other visitors coming in and out. This is the place where, in the words of the Exsultet, heaven was wedded to earth. The Ascension does not mean that Jesus parted from us - rather it means He is universally available. After Jesus ascended into heaven, the apostles "returned to Jerusalem from the mount called Olivet, which is near Jerusalem, a sabbath day's journey away; and when they had entered, they went up to the upper room, where they were staying"(Acts 1:12-13). 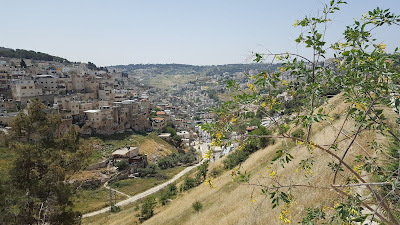 Retracing this route involves going down into the Kidron Valley and then slowly up again to pass south of the Temple Mount and eventually to what is now called Mount Zion, with the dome and clock tower of Dormition Abbey as a landmark. We had previously visited the Upper Room to recall the Last Supper; but now we enter it after remembering the transformative events of the Death and Resurrection of Christ. Like the apostles and the other disciples, we have come to pray for the gift of the Holy Spirit that Jesus promised. Although today's Upper Room is almost certainly larger than in those days, the fact that about 120 disciples gathered there indicates that the original room certainly wasn't tiny either. Before the 1948 War, the place was being used as a mosque, and it still has its mihrab (an alcove indicating the direction of Mecca). On the opposite side of the room is a model of an olive tree, with some branches lopped off and new shoots growing - it presumably refers to St. Paul's image of the Chosen People as an olive tree (Romans 11:17-24). The day the Holy Spirit came is noted, among other things, for the way in which all the people gathered in Jerusalem at that time were able to hear the disciples praising God in their own language. That miracle is usually seen as signifying the fact that people of all nations would become disciples of Jesus Christ and that the Gospel would be proclaimed in every language on earth. 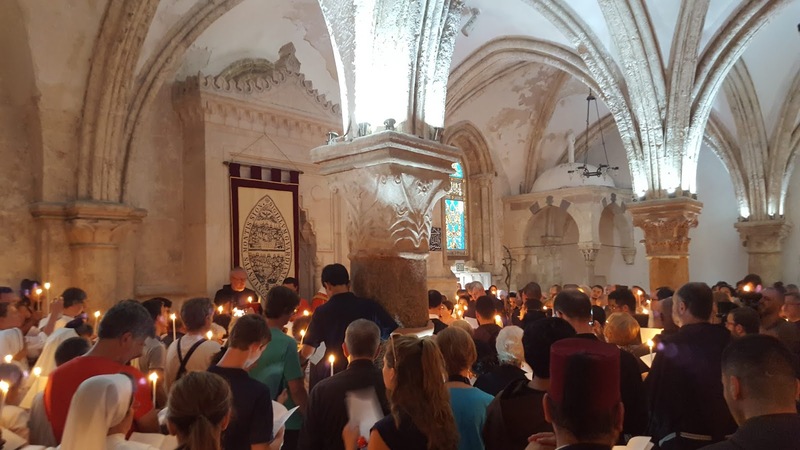 That is now being fulfilled, and even on an ordinary day in the Upper Room you can hear different groups of pilgrims praying and singing in their various languages - an echo of that first Pentecost. Just round the corner from the Garden of Gethsemane, on the way towards the Lions' Gate, the pilgrim can go down to the Tomb of the Virgin. The current church used to be the crypt of a larger church, and you have to descend some stairs even to get to the door of the church, and then down a longer flight of steps into the depths of the earth (as you'll have discovered by now, disabled access isn't really a thing in the Holy Land). Our Lady's tomb is to the right when you reach the bottom. As with her Son's Tomb, the surrounding rock has been quarried away and a small chapel built round it instead. And like her Son's Tomb, this tomb is empty. Catholics and the Eastern Orthodox churches all believe that both the soul and the body of the Blessed Virgin Mary were taken into heaven; but for the details of that there are some different traditions. Some believe that she went up to heaven without dying, like Elijah; but the majority tradition is that she did die first, like her Son. 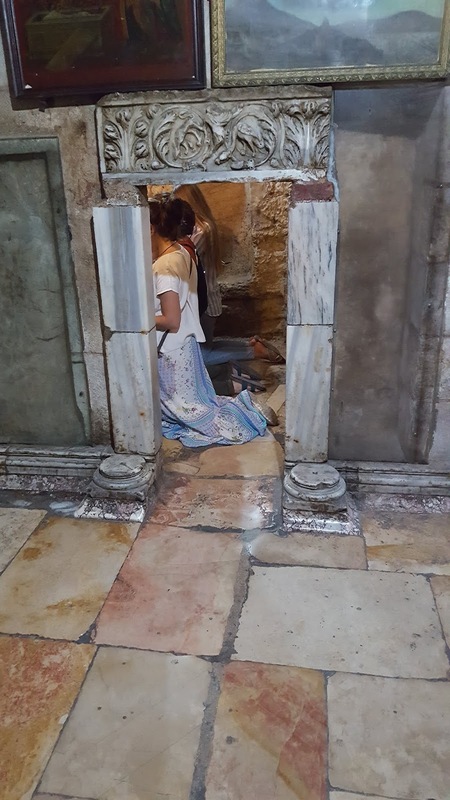 Again, some locate her tomb in Ephesus; but most have her death, burial, and assumption taking place in Jerusalem. My favourite story is the one in which St. Thomas is the only one of the Apostles absent when Mary dies and is buried. On his return to Jerusalem he asks for her tomb to be opened so that he can see her body - but they find the tomb is now empty. In any event, her Assumption is a reminder of how close she was and is to her Son. And it's also a reminder that one day all tombs will be empty. 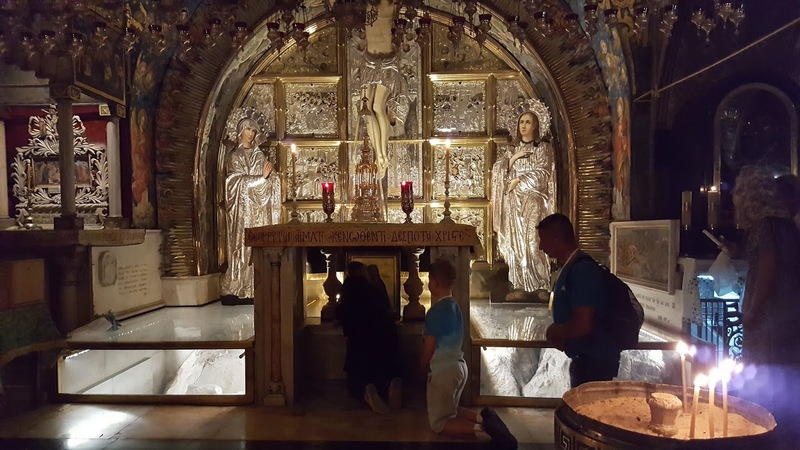 Despite other similarities, the Tomb of the Virgin is not as busy as that of Jesus, so you might be able to spend a few minutes praying in there. If not, however, there's a place you can sit just outside the tomb, with a partial view inside. Our pilgrimage began with Mary, at her home in Nazareth. It will also end with Mary, at her new home in heaven. But not yet. I cannot take you there as I have done for the other places on our pilgrimage. God willing, however, we will meet there one day, when our earthly pilgrimage is ended. It has been good to visit the earthly Jerusalem, "but the Jerusalem above is free, and she is our mother"(Gal 4:26). "And a great sign appeared in heaven: a woman clothed with the sun, with the moon under her feet, and on her head a crown of twelve stars"(Rev 12:1). Now that we have visited the places associated with the joyful and the luminous mysteries, I want to guide you next through the sorrowful mysteries. These are the most geographically limited, only taking 1.3km from beginning to end, but of course their effects are without limit. There are two parts to modern Gethsemane: the part which is still a garden, and the part which has a church built on it. Given that we usually the associate the garden with darkness (actual and metaphorical), it can be quite a surprise to come upon it looking pretty in the sunshine. 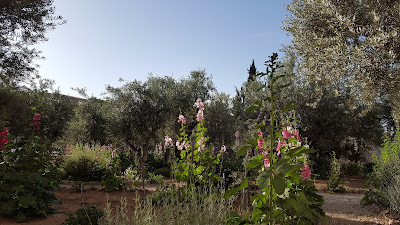 The gnarly olive trees, some of them up to 800 years old, try to look suitably foreboding; but the prevalent sun shining on flowers like hollyhocks and bougainvillea make the place actually rather pleasant. We don't know what it was exactly like 2000 years ago; but there's no reason to suppose it wasn't just as beautiful - a little consolation for the human nature of Jesus in His suffering. In a deliberate attempt to provide a grimmer atmosphere, the church is a darker space, with stained-glass windows that don't let much light through. In front of the altar is a large and mostly flat rock, which is supposed to be the place that Jesus prayed and sweated blood. When I had the privilege of celebrating a Mass there, for a group of American pilgrims, I attempted to startle them by saying that God is 'pro-choice'. But they didn't seem particularly perturbed as I went on to explain that God allowed the disciples to witness something of the agonising choice that Jesus made there in Gethsemane, thus implying the importance of the fact that He did freely choose to undergo His sufferings for our salvation. Behind this lies the mystery of the free will that God gave to all of us. It is the drama of every human story that we have the freedom to choose between good and evil, and it matters drastically which we choose. Leaving Gethsemane and crossing the top of the Kidron Valley, we come up a steep road to the Lions' Gate (thus named from the lions carved upon it) to enter the Old City of Jerusalem. With the Temple Mount to the left of us, we continue up the road until we reach the site of the Antonia fortress - one of the main Roman fortresses in Jerusalem and the traditional site for Christ's trial and condemnation before Pontius Pilate. The main part of the fortress to the left is covered by a Muslim school, but to the right is the Franciscan Monastery (sic) of the Flagellation. 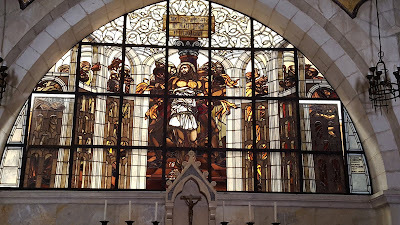 Behind the altar of the church is a stained-glass window depicting the scourging of Jesus. This was a brutal method of punishment, intended to cause open wounds. The severity and duration of it could vary; but when it was a prelude to crucifixion, as in this case, the soldiers probably didn't hold back. Victims sometimes died just as a result of the blood loss. The crowning with thorns probably happened in the same place as the scourging, so the third sorrowful mystery can also be commemorated in the Chapel of the Flagellation (there is a chapel in the Church of the Holy Sepulchre that is dedicated to the crowning with thorns, but it definitely didn't take place there). Painful though the crown of thorns would have been, an essential element to this mystery is the mockery. Apparently being taunted by the soldiers and others was a normal part of the process: punishments like crucifixion were a social, not just a physical annihilation. In the nearby Ecce Homo convent there is a Roman stone pavement (about one hundred years too late to be the one mentioned in John's Gospel, however) with engravings on the stones that some people link to the mocking games soldiers would play with the prisoners. 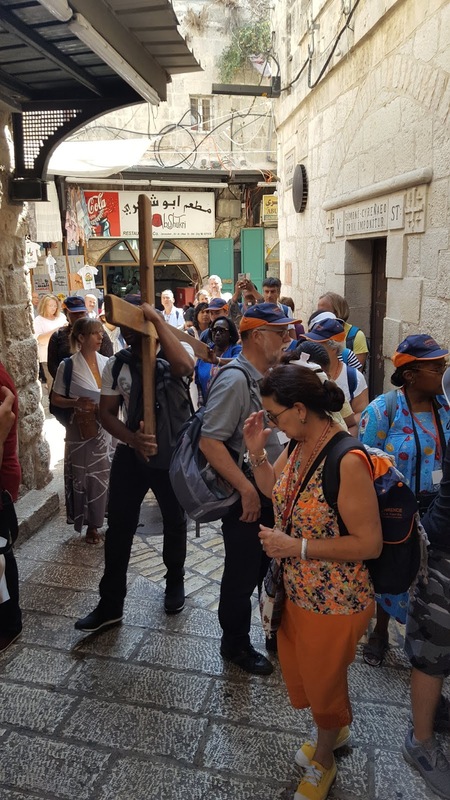 From the Chapel of the Condemnation (also in the grounds of the Flagellation Monastery) to the Church of the Holy Sepulchre is about 600m through the streets of the Old City. Not a long walk under normal circumstances; but of course an ordeal for someone who has already been scourged and lost a lot of blood and is expected to carry a big lump of wood. The route is marked at irregular intervals by chapels, or sometimes just a bronze plaque, for each traditional Station of the Cross. But because of changes in the buildings over the centuries, closing off the route at a couple of spots, the pilgrim has to back-track a little after both the eighth and ninth stations. The stations probably don't correspond to the actual locations of the events. But it's instructive to note, for example, that Simon of Cyrene is commemorated just at the beginning of a long uphill stretch. It's also instructive how the normal life of the Old City continues more-or-less regardless as we follow our Stations of the Cross: shopkeepers carry on their business and people keep squeezing past the groups of pilgrims on their own way somewhere. It was probably much the same when Jesus and two criminals were being led off for execution. Somewhere about the seventh station is where they would have passed out of the city walls on that first Good Friday, although it is now well within the current walls. Executions and burials had to be outside the city. But only a decade or so after the Crucifixion and Resurrection, King Agrippa expanded the city limits northwards, beginning the construction of what is called the Third Wall. After that, no more executions or burials took place where Jesus had been executed and buried. Although the church as a whole is named after the Tomb of Jesus, it also contains the site of His death. Turn immediately right when you enter the church and go up the steep stairs to reach the Chapel of Calvary, which is built on the rocky outcrop where our Lord was crucified (it's not as big a hill as depicted in some films or paintings). 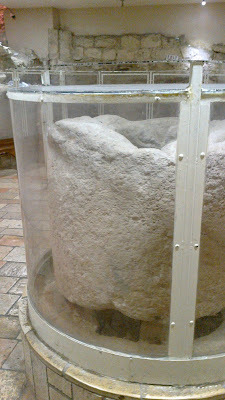 The bedrock has been made visible on either side of the main altar in the chapel, and pilgrims can touch the rock through a hole underneath the altar. This process of venerating the rock of Calvary (or Golgotha, to give it its Hebrew name) is slightly slowed down by the photo-taking tendencies of the modern pilgrim; but an attendant Orthodox monk keeps that under control and there is generally a much more reverential atmosphere about it than in, for example, the Grotto of the Nativity. Only a few steps away, in other parts of the chapel, people are milling around and guides are explaining things; yet it remains the most sombre place of pilgrimage in the Holy Land, as one would expect, and it's a good place to pray if you can find a spot to do so. Christ's sufferings on the Cross lasted only a few hours; but in His Church He continues to suffer the wound of disunity, among other things. The main Chapel of the Crucifixion is under the care of the Greek Orthodox, while a few metres to the side of it is the Catholic Chapel of the Nailing to the Cross. 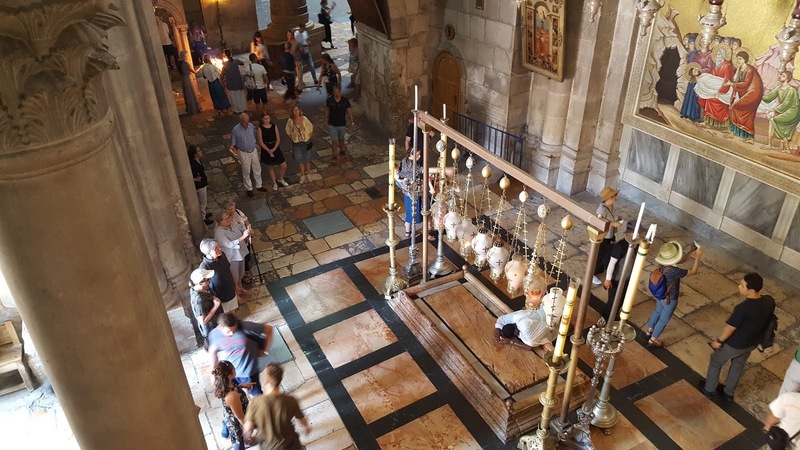 The Armenian and Coptic Churches also have their stake in the Church of the Holy Sepulchre, adding up to a certain counter-witness to the Gospel in the heart of Christendom. Relations between the Churches have improved in recent times; but we still have a long way to go to achieve the unity that Jesus prayed for before His Passion. Ready for the next stage of the Rosary Pilgrimage? Today we visit the places associated with the luminous mysteries of the rosary. It's about 1200m almost straight downhill from Jerusalem to the bottom of the Jordan Valley. The land gets rapidly drier as you pass into the rain shadow of the Judaean Mountains, and it's effectively desert before you get to "The Inn of the Good Samaritan", which is roughly halfway down the road. So when we're told that "all of Jerusalem" went out to John the Baptist at the Jordan (Mark 1:5), that involved crossing this desert. It wasn't a casual journey. But at least they didn't have to contend with the minefields that now block off most of the river - only one road leads through them to the Baptism site. Another difference from Bible times is that increasing water use by Israel, Palestine, and the Kingdom of Jordan has made the lower reaches of the Jordan River little more than a large drainage ditch. The resulting murky waters don't really communicate the idea of cleansing which is part of baptismal symbolism, and I for one did not feel inclined to take a dip. 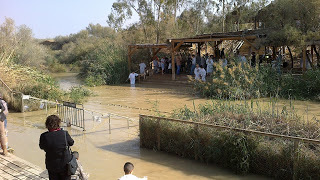 But many pilgrims do decide to re-enact or renew their baptism - and some are actually baptised here - so there are always at least a few white-robed people going into the water, either on the Palestinian or on the Jordanian side, if not both. 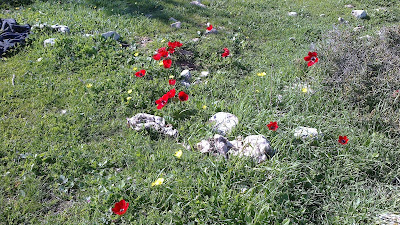 One or two Israeli soldiers keep a discreet eye on what is, after all, an international border. Although the cleansing significance of baptism is somewhat obscured, the significance of the location remains. As I have noted before, the fact that Jesus was baptised at the lowest point on Earth is quite symbolic. 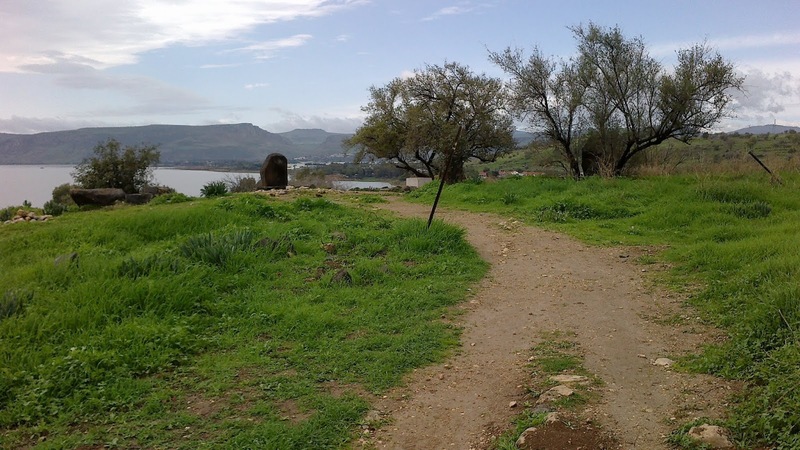 The proximity of Jericho also reminds us that it was around here that the Israelites crossed over the river into the Promised Land, after journeying in the desert. There is some dispute over the actual location of the town of Cana; but the current 'official' holder of the title (so long as you don't ask Lebanese Christians) is Kafr Kanna, only a few kilometres from Nazareth. Certainly it makes sense that it would be somewhere near Nazareth, given the presence of at least one Nazarene family at the wedding there. There are two churches - one Catholic and one Orthodox - commemorating the miracle that Jesus worked at the wedding feast. I think neither church tries to claim that it's on the actual site of that party; the nearest they get to a direct link is that they both display first-century stone jars, as described in John's account of the event. Given that there were six of these jars and each jar held "twenty or thirty gallons"(John 2:6), it's possible to work out that Jesus 'produced' somewhere between 730 and 1,100 bottles of wine. So either it was a very big party or Jesus was being abundantly generous (I favour the latter interpretation). The entrance to the Orthodox church is on the main road. The Catholic church is down a back street and is easier to miss; but you know you're getting near it when you see shops selling 'Cana wine'. Married couples on pilgrimage often renew their wedding vows in this church. When Jesus began His preaching ministry, He moved from Nazareth to make His base in Capernaum, on the northern shores of the Sea of Galilee. It is specifically mentioned as the location for some events in the Gospels, including the healing of Simon Peter's mother-in-law (Mark 1:29-31). 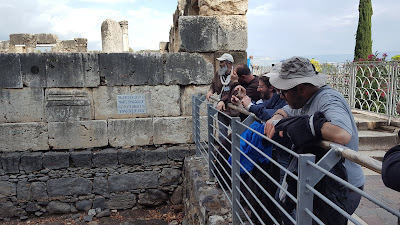 When you enter Capernaum now, the location of Peter's house is immediately apparent by the church poised above it like a UFO that has just landed. This slightly strange architecture is designed to leave the ancient ruins both intact and visible. Not that there is a shortage of ancient ruins - large areas of the town have been excavated. 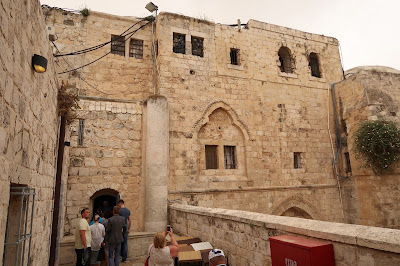 It seems to have been only about 200m across, so it was probably not much of an exaggeration when we are told that "the whole city gathered around the door" of Peter's house (Mark 1:33). Standing out amongst the ruins is an impressive limestone synagogue. It was built in the fourth or fifth century; but at its base you can see the basalt foundations of the first-century synagogue - presumably the one in which Jesus preached. It was here, for example, that He identified Himself as the Bread of Life (John 6:24-59). On one of my visits to Capernaum a storm from the east came across the Sea of Galilee, reminding us of the time Jesus calmed the wind and the waves. The Sermon on the Mount, and the Beatitudes in particular, can be seen as manifesto or even a Constitution for the Kingdom of God, so the Mount of the Beatitudes is an alternative location for remembering the third luminous mystery. It's only a couple of kilometres along the Galilee coast from Capernaum. 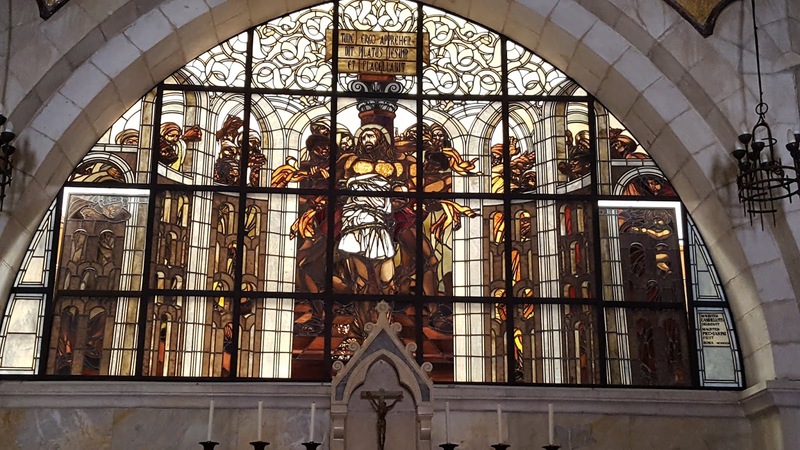 A church at the top of the hill, surrounded by beautiful gardens, commemorates the Beatitudes. But some think that Jesus actually gave His most famous sermon further down the hill, on a shelf of land that is high enough to fit Matthew's account of Jesus going "up on the mountain"(Matt 5:1), but also matches Luke's description whereby Jesus "came down and stood on a level place"(Luke 6:17). In any event, this location is among my favourites for its simple beauty and for the fact that a church hasn't been slapped on top of it, which makes it easier to imagine the original occasion. The space is big enough for a large crowd of people; but small enough that Jesus could be heard clearly, without a "Blessed are the cheese-makers" incident. Standing somewhat apart from the other mountains of Galilee, Mount Tabor rises about 400m above the surrounding plain. 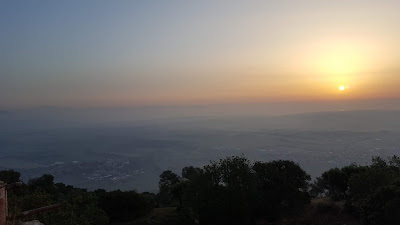 Traditionally identified as the place of the Transfiguration, it certainly fits the description of "a high mountain [where they could be] apart by themselves"(Mark 9:2). I don't know what the vegetation was like in Gospel times; but now the mountain is mostly covered with trees, although they get a bit scrub-like towards the peak. Buses and coaches are not normally allowed up the winding road to the top, so large groups of pilgrims have to be dropped off at a small bus station on the lower slopes, from where they can pile into the minibuses that shuttle up and down the mountain all day. Reasonably fit pilgrims with time on their hands can choose to emulate Jesus and the disciples and walk up instead - either along the road or by the footpath that goes straight up through the woods (as for most other paths in Israel, the way-markers are painted on the rocks). 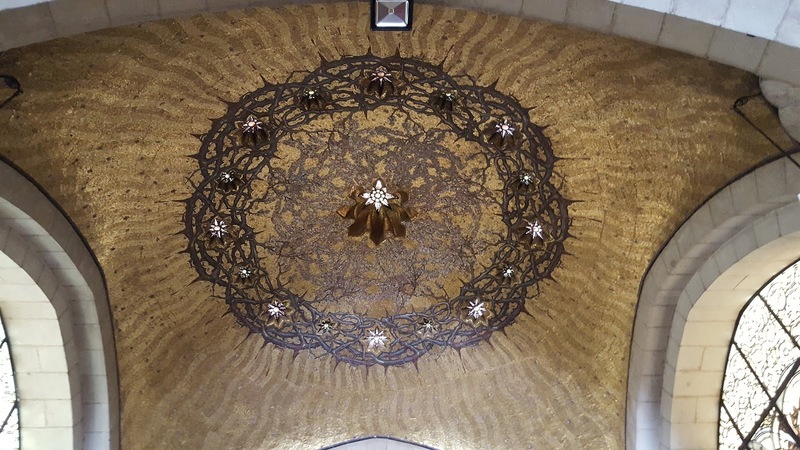 Like many other churches in the Holy Land, the Basilica of the Transfiguration is of fairly recent construction (within the past century or so) but on the remains of older churches. 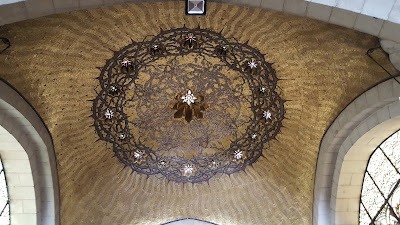 It has a nice mosaic of the Transfiguration, and chapels dedicated to Moses and Elijah. Attached to the church are a couple of viewing platforms, from which one can see across a lot of Galilee and beyond. The wide plain immediately below the Mount is the Valley of Jezreel. On one visit I was privileged to stay the night at the Franciscan friary there. Once the gates are closed in the evening it becomes very quiet - the only habitations are the friary and the Greek Orthodox monastery just below the peak. I could understand why Jesus took the disciples there for a time of prayer, as the cool evening breeze blew past and the busy human world seemed far away. Although it is currently a little way outside the Zion Gate, the site of the Last Supper was originally within the walls of the city. For some reason that no one seems sure of, the Ottoman rebuilding of the walls omitted to include the Upper Room - despite the fact that it was being used as a mosque at the time. The place itself has been thoroughly rebuilt at least twice during the last 2000 years, so nobody tries to claim that it is the actual room in which Jesus ate with the Twelve (that would have been rather smaller, for one thing). But it is almost certainly in the right place. And the surrounding buildings help to retain the feel of the original place, which was in a crowded suburb of Jerusalem. There are usually plenty of people in the neighbourhood, because there is also a synagogue on the ground floor, centered on the 'Tomb of David' (it almost certainly isn't his tomb, but never mind), which draws Jews and sometimes Muslims to visit. This is in addition, of course, to the Christian pilgrims visiting the floor above. Due to the vagaries of history, the place is currently under the control of the Israeli government. Sadly, this means that the Eucharist cannot be celebrated in the place where it was instituted. Formal prayer services are allowed, however, on Holy Thursday, Pentecost, and the Week of Prayer for Christian Unity, and informal prayer is allowed at all other times - so you can pray your rosary, no problem! We will return to the Upper Room in a later post, when considering the third glorious mystery.